Lets be honest. Those of us who can navigate the internet and have a love for music have found “alternative” ways to “acquire” music. Our mass storage devices are loaded with gigabytes, maybe even terabytes, of music. I was never a slave to iTunes. I could not wrap my finger around the concept of paying for music files. At least when you used to pay for albums, weather it be cd or vinyl, you got something for what you paid for. Something you could read, display, and collect. I just couldn’t do it. I used to even have a problem buying cd’s. Back when cd burners were the rage, I remember stores in the mall selling albums on CD for up to $20.00, regular price. Why on earth would anybody pay for something that they can whip up in seconds on their home computers. Both sides were to blame for the death of the CD industry, but I’m not blogging this to talk about the death of the record store. You see, I may not pay for cds, or an mp3/mp4, but there is one thing I will pay for…convenience. Even when I “acquired” music online using other methods, you still had to load up the mp3 player, or iPod, or have your folders organized so that accessing your collection via cloud on your phone would be easy. There was lots of effort involved. An then (at least for me) I’d be bored of what I had loaded up within days. Not anymore. A few weeks back I decided to try “Spotify”. On Spotify’s website, you can download their software, which looks similar to iTunes. After free signup, you get 20 hours a month for free, a trial similar to Pandora. The difference? 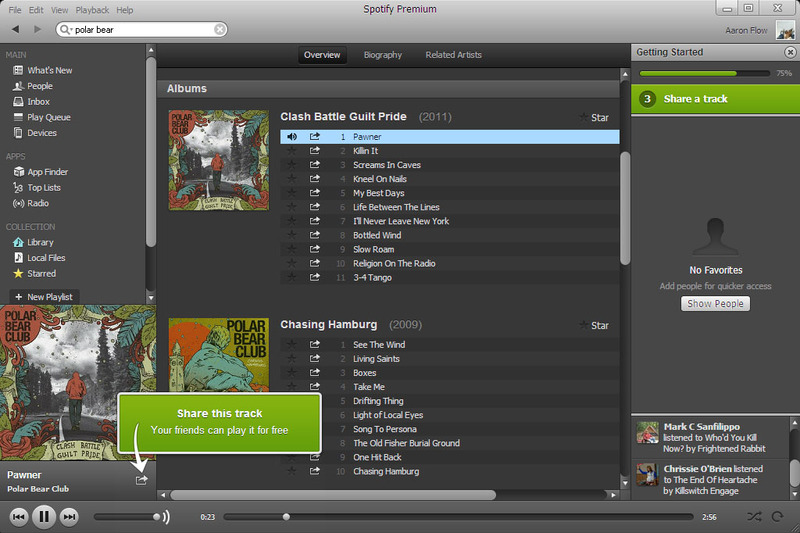 You don’t have to sit around hoping that Spotify will learn what you want to hear. You simply enter the artist, song, or album you want to listen to and listen. Its like having all the music you can think of at your fingertips. It’s not like “Grooveshark” where you have to sort through nonsense to get what you want. Its that simple and it rules. At first I was like, “20 hours should be plenty”. It totally wasn’t. I listen to music during my work week all day, so I was out of minutes pretty quick. So for $4.95 a month, you can have unlimited access to Spotify on your computer. Worth every penny. For $9.95 you get unlimited access to Spotify on your computer, plus access to the Spotify phone app which allows you unlimited streaming away from your computer. Unless you are in an area that has no cell coverage, you no longer need to load up an Mp3 player. I love this service and am proud to be legit. Highly recommend trying this out.